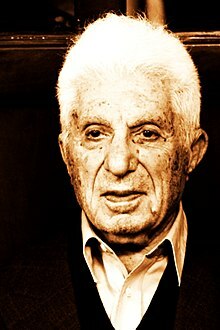 Fazlollah Reza (Persian: فضل‌الله رضا‎) (born January 1, 1915) is an Iranian university professor. He was born in Rasht. He is a Fellow of the IEEE and AAAS for his works to network and information theory. He is an honorary member of the Academy of Persian Language and Literature and has written and spoken extensively on classical Persian poetry. Reza was the head of Aryamehr University of Industry (Sharif University of Technology), University of Tehran, Iran's ambassador to Canada and Iran's ambassador to UNESCO. As a professor, he has taught at MIT, McGill University, and University of Tehran. Reza, Fazlollah M. (1971). Linear spaces in engineering. This page was last changed on 23 August 2018, at 08:42.